“Solomon, I have traveled far to learn about your Goddess of Wisdom. May I ask how you propose teaching me the wisdom you have somehow acquired?” How did Solomon answer this question posed to him by Bilqis, Queen of Sheba? This biblical fiction novel described in first person by Solomon is based on carefully researched biblical stories and legends that relates to our time to both entertain and inspire readers. We face many of the same basic social and physical challenges in life today as our ancestors. The novel re-tells and embellishes their meetings in an enjoyable and meaningful manner to emphasize how wisdom helps guide us from making foolish decisions. When you finish reading the characterizations, you will know well their personal thoughts and motivations to seek wisdom and love. One of the best books I read in awhile. As all the elements of a true modern day love story. Would hold up to todays modern day love story. Shows that love is eternal. Great Book. This story features many facets yet it’s easy to follow. Bilqis’ riddles and Solomon’s wisdom stirs my thinking and sense of wonder, what will happen next. With excellent descriptions I can see the landscape and capture the essence of the situations and strong emotions. The bibical story of the Queen of Sheba traveling to personally visit King Solomon has always been a rich source of speculation. What did she talk about to the King of Israel? What did they have in common, and why was the Queen on a quest for wisdom? She is a mystery because she was a woman obviously ambitious and intelligent. Mr. Martinka slowly reveals qualities the queen possesses. How does he do this? He cleverly connects the Book of Proverbs as conversation starters for their meetings. The conversations are stimulating and can be appplied to issues of today. Mr. Martinka’s Blog on Facebook reinforces contemporary issues based on these conversations. All are interwoven with history, cultures, intrigue, and romance. I enjoyed getting to know and understand this Queen. The mystery continues which makes more fasinating reading possible. Reviewed By Bruce Cook for Readers’ FavoriteIn his historical novel, As a Lily Among Thorns, Rudy Martinka has accomplished a milestone in documenting the life of King Solomon. His novel is unique in its historical and archaeological accuracy, its clear chronology of events, and its variety of perspectives on events during these historical times. I commend Rudy Martinka for telling his story through a first person account by King Solomon. Too often the third person approach to history makes for difficult reading. Martinka’s approach makes the story come alive. He uses italicized passages in which characters relate historical and philosophical information that would be far more difficult to read if presented in standard format. 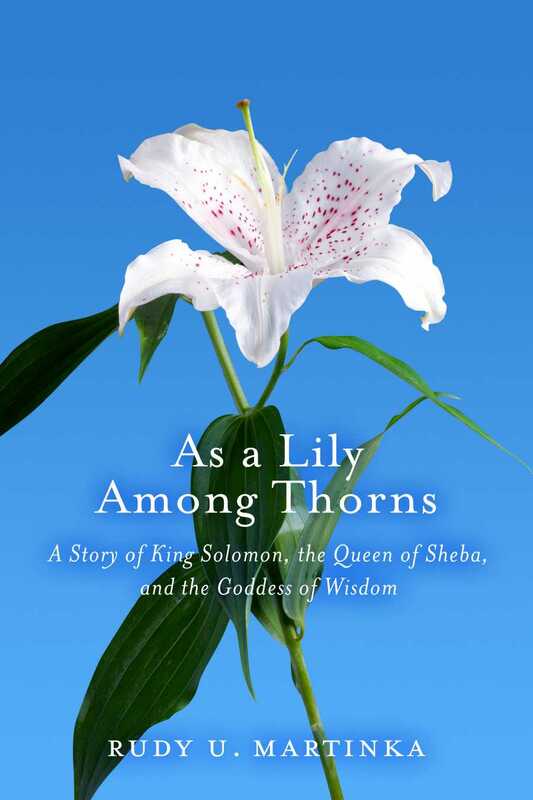 Throughout this book, the author provides an impeccable description of Solomon and the Queen of Sheba during a visit the queen made to his palace. The text is replete with conversations between them in which she questions him regarding his background, riddles, and philosophy. These dialogues are invaluable in helping the reader understand the history and beliefs of the times. The story becomes intensely personal and dramatic as a love relationship between Solomon and Bilqis continues. The juxtaposition of events in the story offers a clear account of what happened and when in a way that other historical accounts could not do. Many know something about King Solomon, the queen of Sheba, their son Menelik, David and Goliath, the Ark of the Covenant, or Solomon’s wise decision between two harlots who came to his court, both claiming to be mother of a child. But few have an idea of these stories in relationship to each other in time and place. This brings the story together in a way that the best novels do with their situations and characters. A preface and epilogue give evidence of the careful scholarship the author devoted to the writing of this book. Here the scholarly and archaeological research that underpins the story is clearly explained. This book is a powerful statement and should be read by anyone interested in learning about the Old Testament and King Solomon. May be available in your library as an ebook. Have we not found myriad viewpoints and interpretations of the book of wisdom? No doubt the best place to read is from the book itself. Let the wisest man who ever lived say what he has learned from his Creator. Digging deeper into his words will surely teach us more than any other man can teach us. Thank you for commenting and good will blogging. I may not understand your point. Can you tell me in a few words what to look for? When you commented on my article about Solomon’s covetousness, you mentioned there was no historical evidence that Solomon lived. Do you adhere to that opinion? I believe you can read the excepts posted on my blog to understand that I am trying to convey the wisdom of Solomon and many other ancient wisdom authors words of wisdom. While I personally believe that Solomon did indeed live, there are many that question the validity of Biblical writings and events. Archaeologists spend life times to prove or disapprove myths and are trained to produce evidence before they can report any findings. The reference book I used exclusively authored by Dr W.Mckane goes into details of how all proverbs attributed to Solomon may or may not be the same author because of grammar and writing styles. However, myth or not, the proverbs and wise sayings convey wisdom acquired and religious faith is a personal matter for all of us to come to terms with.in my humble opinion. Thank your for commenting your insightful thoughts. I understand that the reality of our modern life is a reluctance to seek out more “rules” – but the answer, surely, is not to give more romantic, unrealistic concepts. Rather, the original author of all things, God, is more than capable of telling a great story. We just need to go back to it. There in lies the source of love and wisdom. We as mere humans are incapable of truly expressing that better than God does. I haven’t read your book, so how do you go about explaining “their personal thoughts and motivations to seek wisdom and love”? The Bible declares what the Queen of Sheba’s motivation was – “she came to prove him” (1 Kings 10:1). What do you hope to convey that isn’t covered in the story? How does the conjecture of a romance between them beneficial to the story? Wisdom. May I suggest you check out my blog page and look over the excerpts of my book to evaluate my intentions which is to promote the wisdom of God from the proverbs written hundreds of years before the bible and are still applicable today. Anything we can do together to promote wisdom in my opinion is worthwhile and badly needed today. My novel is biblical fiction, however, I believe it is more than fiction because everything I wrote that was said by Solomon has been refered to a proverb or wise saying ir and the very extensive research by Dr McKane.. I went and read several excerpts from the book. I suppose I don’t understand why you felt the need to write the book to make your points. Why not just quote the scriptures and give the credit to God directly? Do you believe that the world is such that they won’t hear Him when presented with the words outright? Or do you believe that His telling is lacking so much that it won’t be understood? I do understand the thought process of thinking a modern rendition might bring more to an understanding. My love and knowledge of the book of Song of Solomon moves me to want to make it more accessible to the reader. But I realized that there was nothing I could add to the book, and I would be taking away from it to try to “rewrite it”. I don’t have more knowledge than God. I don’t understand His audience better than He does. His word is sufficient and beneficial as it is. We just need to read it. I will grant that maybe it is just a matter of personal taste as to whether or not that is done through what is intended as a modern parable type tale or an accurate exegesis type Bible study of the scripture – both must be scriptural accurate to be of any benefit to the one reading them. Thanks for reading and your insightful thoughts. I believe any means to achieve conveying Gods Wisdom is better than continuing to read in the news and hear on the radio all the foolish decisions taking place around the world in spite of millions of Bibles and scriptures. This however is my personal opinion and you are entitled to yours and I commend and thank you for sharing your insights. What I am about to tell you is not opinion. It is fact. In a court of law, it only takes two eye witnesses establish a matter (e.g. to put a man to death). The prophets Samuel, Nathan, Gad, and Jasher all had a part in writing the books of 1 & 2 Samuel and 1 & 2 Kings. The books of the Kings are named from their contents, since the entire subject of the whole is the history of the “kings” of Israel and Judah from the accession of Solomon to the Babylonian captivity. Jewish tradition assigns the authorship of Kings to Jeremiah; and there are very weighty arguments in favor of this view. Such phrases as “the chronicles of King David” 1 Chronicles 27:24, “the acts of Samuel the Seer,” “the acts of Nathan the Prophet,” “The acts of Gad the Seer” 1 Chronicles 29:29, “the Prophecy of Ahijah the Shilohite,” “the visions of Iddo the Seer” 2 Chronicles 9:29, “the acts of Shemaiah the Prophet,” “Iddo the Seer on Genealogies” 2 Chronicles 12:15, “the Commentary of the Prophet Iddo” 2 Chronicles 13:22, “the acts of Jehu the son of Hanani” 2 Chronicles 20:34, “the commentary of the book of the kings” 2 Chronicles 24:27, “Isaiah’s acts of Uzziah” 26:22, “the vision of Isaiah” 2 Chronicles 32:32, and “the acts of Hosai” (2 Chronicles 33:19) all give specific names of qualified eye witnesses to the history of that time. Why do I say all this? I want you to consider the number of witnesses to the fact that Solomon lived and reigned and was a real man—not a mythical figure of someone’s imagination. And if that evidence were not enough, think of all the witnesses in the New Testament that confirm Solomon’s existence. All these New Testament scriptures testify to the fact that Solomon was indeed a king in Israel (Matt.1:6-7; 6:29; 12:42; Luke 11:31; 12:27 and Acts 7:47). How many witnesses do you need when today it only takes two to put a man to death? I personally believe Solomon existed. I spent five years research while writing my novel and both admire and promote his wisdom in relation to today’s modern world. I am especially in agreement with his statement of “nothing is new under the sun.” We face many of the same or similar challenges today as in ancient times. However, In researching the many various sources, the reality is that there are numerous scientific, philosophical, and religious beliefs in the world. In my novel I believe I carefully expressed the philosophy of King Solomon based on writings attributed in his name..One source commented that King Solomon was recognized as one of the earliest philosophers in the world. Thank you again for expressing your insightful comments.and opinion. i clearly am out of my league here, as i have never read any holy books; and most definitely have not even touched on King Solomon until recently – until i do some research on King Solomon I wanted to talk about some of the conversation above. first i just want to say thank you for your wisdom and knowledge. i have very little to offer except for my having been brought up in a family of love. i am the son of a sheep herder with very little education. my upbringing was a non religious one, as my father passed on what had been passed down(verbally) to him growing up. i have learnt that when one passes down verbal law it means it is hidden from the very dark that awaits to destroy you by destroying your history! so i ask “why is that man and woman, have not heeded the very essence of life itself?” even empowered with such divine teachings, being holy scripture’s..many are so lost like sheep they follow the wolf into the dark; and there they are ‘fed and fattened’ with lies that it is no wonder we have swayed from our life of love, charity and forgiveness – that was the essence of my upbringing and what i thought religion was..until now. coming from a non religious family it is not hard even for me to understand what was willed and conveyed through the chosen messengers..why do we question our prophets? did they all(messengers) not withstand time itself to convey the most divine of most humble offerings? How many Kings, Pharaohs, Shebas have we known to have passed through the sands of time? What is left of the pyramids? Empires we call them now..they are there(pyramids); but gone is the authority which our last prophet, messenger and enforcers of the very same commandments that were passed down..
did this most humble man(Jesus) create law? of a higher authority of life itself? Jesus was the saviour and announced King by what was then the blind as is now! How hard is it to “love thy neighbour?” We still need the abomination called ‘the church’ to do this? a proxy of God? ..that is like I just did ^above -label our most gracious, most merciful who granted us a chance to be even in the very shadow and image of life itself! for this we slaughter and murder each other, as this is what was commanded of us? is this what the lost preach to the blind? or are they really lost? it seems structural to me..there is an apex as was then, the days of the Pharaohs and their pyramids..! it is no different. to claim you: “continue doing the “work” of the chosen ones” and do NOTHING while children die with even the slightest change of wind -thirsty, cold STARVING while these so called holy of holiest of so called gods proxies are fed, fat, warm and sheltered! Was it not written and is still known today, that no mortal man shall stand even in the shadow of the one ‘they’ call GOD let alone pray to a statue or wear the very cross King Jesus was killed on in order to be received better than a lesser who has no church or preacher to inflict the spell of darkness unto..i suppose the grander the church the better reception? It is a portal to ‘their’ so called ‘GOD’ is it not? Or is it Jesus they are praying to when they kneel before that giant cross in that building labelled ‘church’ -it could also be a statue of Mary made of the finest materials where it guaranteed a lifetime of service from Mary. is this what is conveyed to us through what we believe is this scripture we see before us today? the bible? when i first wanted to read the bible i asked a friend if she could help me. being in the age of technology and having no clue of even where to find a bible she sent me a link through the Internet to a website called biblehub -that day i was frustrated and a little upset at my friend as she left me in the dark..the next day on Facebook i asked her why she didn’t give me the proper link! having only watched movies; and celebrating christmas and easter with my family, who bored me to death during those times and not even laid eyes on a bible; only to find when i was finally ready and rid of my parents I was confronted with a ‘drop down menu?? ?’ i remember it clearly..i was bewildered as to ‘which’ one was the actual bible i actually gave up at the time thinking she played a joke on me…it was actually quite amusing reading her answer as to ‘which’ bible was the real one..the “untouched version” i asked her..she could not answer. i challenge anyone who reads this to prove that if i do not attend a ‘church’ or any building labelled “holy” every Sunday; OR Friday; OR any day they deem “holy”, that they will see heaven before me..anyone? let’s see what “wisdom” has been gained by “following backward” over all this time..
Rudy i am glad we crossed paths; and i will buy your book even though i have not read a single page in what seems and eternity. i am the uneducated son of a sheep herder; and for this i bring neither wisdom or knowledge and only ‘questions’ of King Soloman, this once great who still is spoken of even today. i would like to learn of this once great King and the wisdom he passed onto the people of the time. I recently read that the kingdom of soloman exists and we have been fed a lie; a lie upon a lie, drowning in our very sorrow while the ‘lords’ of today continue to destroy history under our very noses. this is why i would like to learn of solomon and this queen you speak of..? Thank you for sharing your thoughts. What our world needs now is both wisdom and love. The Bible is well worth your time and effort. I wish I had spent more time in my youth reading and applying Gods revelations to help us find peace during the best and worse times we will experience in our short time of life. I personally relate the Old Testament as a search for wisdom and the New Testament a search for love. until yesterday i still didn’t know what was old and what was new to be quite honest. it did not make a difference to me anyway as my focus was and is with the divine and supreme, the master of what was and will be. my awakening was recent so it is catch up for me learning how to write properly, extend my vocabulary and try to find my way through-all-this-noise..which is intentionally instilled unto the people using many tools of installations to try tap into the two main traits we can never rid ourselves of one is dependance as this was reflex to us from our mother as child; by creating an atmosphere where we question even the most basic instructions -dependance on money(usury) which is a form of slavery and reliance on governance to protect us ‘vulnerable’ from the very snake we feed the poison too which eventually kills us ..the other is the most important: it is resistance which we learnt of also while still on mothers breast of life..sorry if anyone did not have a mother. it was not intentional. it doesn’t matter who it is ((recall) when our stomachs were full, even though we learnt of pain -we learnt to ‘resist’ our mothers breast and giver of life when our stomachs were full! this was our first experience of pain where we learnt to resist. our being dependent or feeling dependance is so important to us and is the easiest to break. it creates an atmosphere of ‘helplessness’ once again we question and after a while even seeing our most highest of gods proxies pray to a statue in front of millions upon millions of blind followers gives way and goes against the very essence of what was commanded! sorry i have swayed but it is important and ties in with King Solomon also as for thousands of years now history is being destroyed and manipulated to an extent where even we no longer have ‘reason’ to question – why? you touched on that above..
if your “television” tells you and the rest of the zombies at 6pm that this is ‘correct and true’ then it must be right? free-mas0-nry and their thirst for this knowledge they so wish to gain. a confused sort they are as they think bond-ship between men is showing love. many do not even know they are mere foot soldiers to the same apex who brings darkness. i have traced what i believe is the Te-mpl-ars in an order in Jerusalem. they ‘rose’ long ago – of course their bond is with the giver of infinite love so they do not dare wag their tongues. that is true love not some sect that is taught to only love with ‘bound’ love has no bound! it cannot have bound. i have written of love and how man has created and knows love as only an emotion! this saddens me. love is and should be most cherished as we were born of innocence in the image of the most gracious and most merciful where it was written and told of throughout time. what does not love? who does not love? this so called chore called an emotion..
if love was never to be, then we would not have reason; and if we had no reason then what would become of us..it relates also to greed and selfishness- but we are losing that one reflex i write of and if we are only shown death and despair then what is to become of us? these people have no shame – shame i relate to ones soul so if you have no shame then you are soulless or empty, black! it is deeper than i first thought my friend and we are mere pawns expendable list souls to the ‘lords’ of today as we were during the times of the kings of yesterday. mere slaves to serve a purpose. one thing i have learnt is that fasting builds up your resistance and brings back what is reflex to us and allows you to come to a realisation that you only bow down to the one truth and one truth only for who are we to question our lord who we have forsaken. ask were we not shown free will? it is written somewhere i have been told of this. of me i cannot put pen to paper. perhaps together we can help each other as i am sure Sheba and Solomon found out that having all the wisdom in the world means nothing without love – be focussed kind soul and question as you do for you have reason and without reason ask where would you be? i will stop now as it is daylight and my study time is over. i have learnt a lot from this today and with this it strengthens my resolve in helping others awaken from this darkness we think is life.